October 31, 2011 - Happy Hallowe'en! This year the trick or treat gang expanded to include the McGillvary's. Sarah sported her all-time favourite dinosaur costumer, although did make appearances at Hallowe'en parties this year as both Snow White and a Bumblebee. 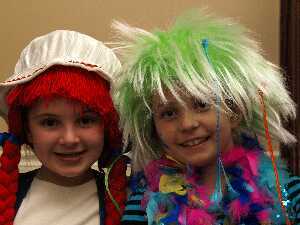 The other two were no other than Raggedy Ann and Al Kapone, and a handsome Al I must admit! October 31, 2010 - Happy Hallowe'en! This year was Sarah's first experience trick or treating and while she repeatedly belted out trick or treat between houses she was silent at the door and more interested in the ceramic animals on the neighbour's porch, than the candy. The dinosaur costume was dressed up with some pretty pink boots. As for the other two, both went vamp this year, a tribute to the Twlight Cullen/s and had a great time trick or treating with the Sagredo's. August 18, 2010 - The Great Cottage Escape! This year we made a great escape to the North with six days on Camel Lake thanks to the Mackenzie's and then another three days on the shores of Eel Lake with the cousins. Fun was had by all! 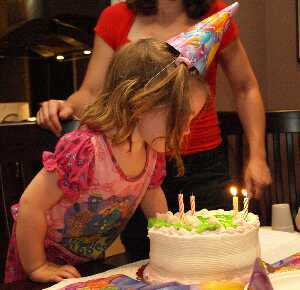 August 1, 2010 - Sarah Turns Two! Sarah turned the big two August 1st and we celebrated with the cousins with cake, presents, and a trip to Ontario Place. The highlight was Owen and Kieran's first ride on the drop zone...not so sure they liked it that much but when they got off Kieran insisted "IT WAS AWESOME!" It was another memorable weekend on Cow Island with the Booth's, complete with fishing, rock panting, bonfires and the return of the beer marisupel! July 1, 2010 - Canada Day! 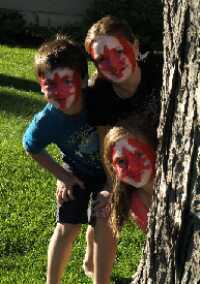 This year, Kate, Kieran and Krystyna did Canada Day in style with some stylish face paiinting. This year we headed down to Humber Bay where we saw not one, but about 10 firework displays. Both girls fell asleep with Kieran pushing Kate in the jogging stroller back to the car. 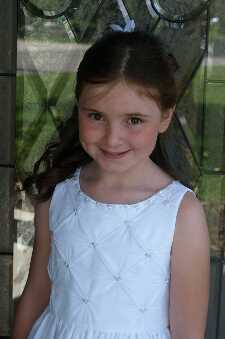 On June 5, 2010 Kate made her first communion at St. Pius X Church. The day started early with a hair appointment at 10am for Frannie, Kate and Stephanie where the girls were done up in style. The ceremony was at 5pm and Kate was truly beautiful. We had a gathering of close family and friends at the house afterward which made the occasion even more special. Here are some of our favourite shots. 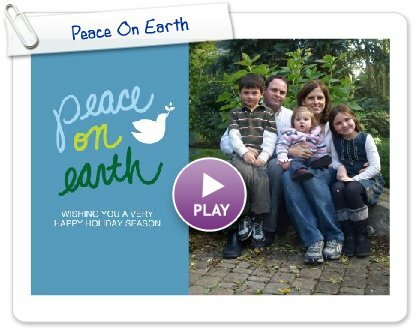 December 25, 2009 - Merry Christmas! October 31, 2009 - It's Halloween! It was the usual trick or treating en masse for the Wingrove/Haliburton gang this year and all were in their finest form. 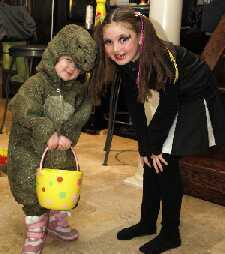 The Cullen kids sported a variety of costumes from Harry Potter's Hermione to a ghoulish ghoul, to a wee sweet princess. 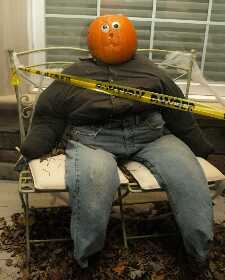 We also had the headless horseman join us on the front porch...however, he turned out to look more like the handyman! 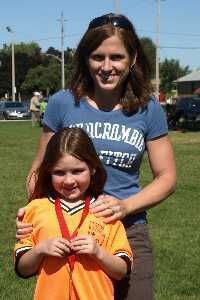 Against all odds, Kate's team made it to the finals and only lost to the 1st place team after a very long kick off. It was a great day for a match and after it was over Andrew, Kate and I went for a special lunch complete the root beer and brownies. 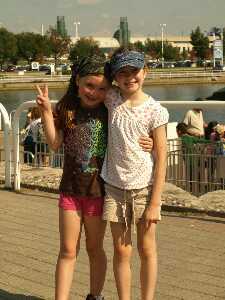 We finihsed off the summer Labour Day weekend with a trip to Ontario Place and the Air Show with the Hamms and the Booths. 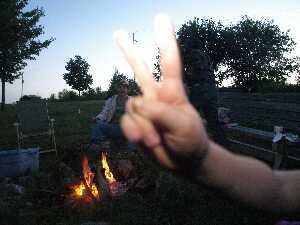 After a fun-filled day, and only a sign was injured in the process, we headed back to our place for some 'cottage in the city'; complete with a BBQ, swimming, campfire, and some Smores. This year marked our 8th annual trip to Tobermory. The week was complete with a trip to the beach, a day at Flowerpot Island, canoeing, hiking, kayaking, a little geo-cashing, and of course fish n'chips and ice cream. 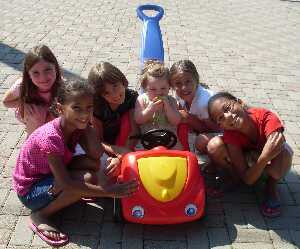 August 18, 2009 - Summer is Finally Here! Well, it took until about the first week of August, but summer finally came. 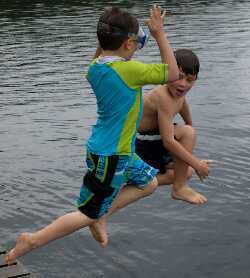 Here are some shots down by the creek, of the neighbourhood kids and of the pool (finally). 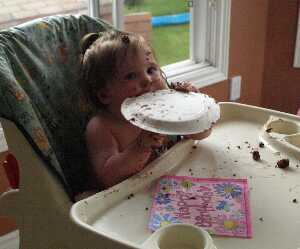 August 8, 2009 - Sarah Turns One! Sarah turned one on August 1st and we celebrated with two birthday parties. One was at the McAllisters', complete with swimming, trampoline, games and of course, lots of cake. The other was at our place with family and friends; the hot tub being the highlight rather than the cake (kids these days!). As Sarah is quickly approaching her first birthday we decided to get some pictures of her. Thanks to our friend Kathryn we caught Sarah on film at some of her best moments. Here are a few shots from the day. June 25, 2009 - Kieran Graduates! 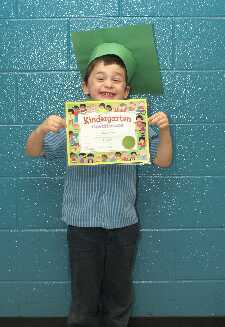 Kieran, following in Kate's footsteps, graduated from Kindergarden this year and is off to the big world of Grade One. As you can see, he was quite proud of his achievement. 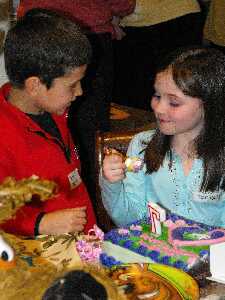 March 6, 2009 - Scooby Dooby Doo...Kate is Seven! This year was a Scooby-Doo Extravangaza...complete with a mystery and lots of cluse to lead to the prize! To figure out the mystery our guests went on a hunt for clues with fun-filled activites at every stop...Dance Freeze, Carry the Bone, Make a Mummy, Pin-the-Tale on Wivam (the evil Monster in the story) and Build a Mystery Machine. The prize...a Scooby_Doo Pinata with lots of treats! Fun was had by all and it was an example of project management at its finest!